They stepped onto the stage with their heads held high, conveying a sense of confidence that seemed outsized compared to their tiny frames. Outfitted in colorful African prints, and bare feet, they found their places, bowed their heads, and waited for their music to start. The first beats of the African drums brought them to life. 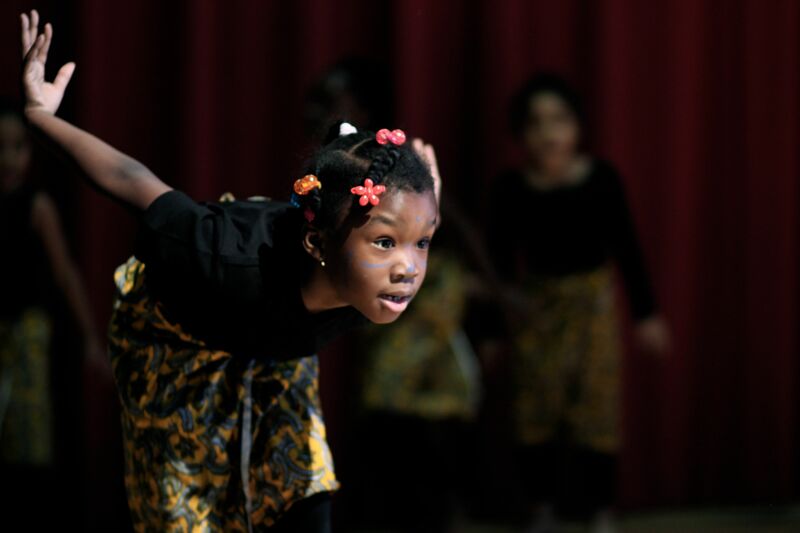 Little arms swinging, feet tapping, and heads snapping to the tempo, the pint-sized members of the Democracy Prep Harlem Elementary dance team instantly evoked cheers from the crowd at our New York network-wide professional development meeting in February. The dance choreography was the work of DPHE arts teacher, Kaslyn Harris-Jordan who introduces the scholars to a different style of dance each month. After four weeks of instruction, the scholars perform, showing off the techniques and performance skills they have acquired. At the end of the February performance, Harris-Jordan said she “felt like a proud mother,” and that her little dancers left the stage feeling like stars. Their next major performance will be at our Gala, “Spotlight: A Celebration of the Arts” where they will perform a selection of jazz dance numbers.